Environmental victories are so rare that apparently even environmentalists don’t quite know how to kick back and rejoice. At a rally in Trenton, New Jersey on Monday, discussion veered between joyous celebration of Friday’s announcement by the Delaware River Basin Commission (DRBC) to indefinitely postpone a vote that would have paved the way for 20,000 natural gas wells in the region and serious preparation to one day block their construction through nonviolent direct action. 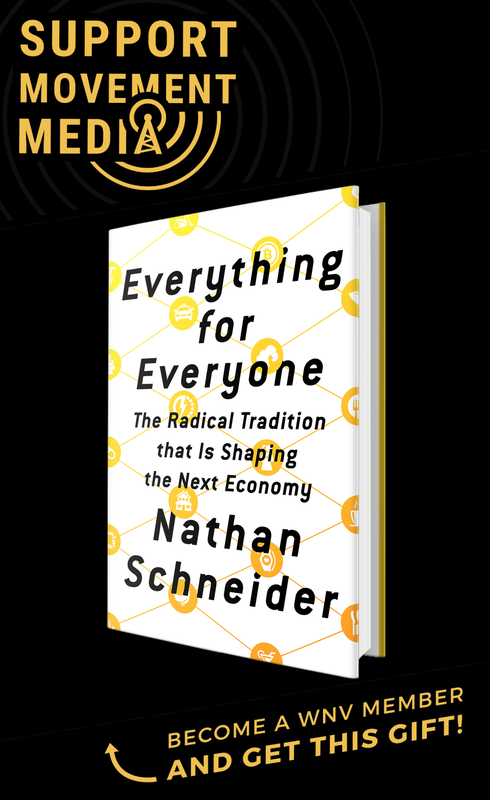 These activists can be excused, however, for mixing business with pleasure because even more rare than an environmental victory is one that’s complete and total. Much like the recent announcement by the Obama administration to delay a decision on the KeystoneXL pipeline that would transport tar sands oil from Canada to Texas, the DRBC vote delay was hardly an indictment of extreme carbon-based extraction that poisons water and the atmosphere. If anything, it’s a temporary roadblock to something government seems all too happy to allow. Pennsylvania Governor Tom Corbett and New Jersey Governor Chris Christie have already promised to vote “yes” for drilling in the Delaware River Basin–a region that provides drinking water to 15 million people. Corbett is no surprise because drilling–or fracking as it’s more commonly called–is already a common practice in Pennsylvania. New Jersey, on the other hand, does not have any natural gas deposits. But it does have Christie, who earned nearly $30,000 last year from selling his shares in a company whose clients include gas drilling operators. The holdouts as of now are New York Governor Andrew Cuomo and Delaware Governor Jack Markell–neither of whom are sure bets to stay that way. Both would apparently switch their vote if the right regulatory processes were put in place. Nevertheless, Markell’s decision to vote “no” came as a surprise, since it is believed that the Obama administration–DRBC’s fifth and final voting member–was pushing the Delaware governor to vote “yes” so that it wouldn’t have to and thereby tarnish its environmental image. Fittingly, perhaps, these two issues overlap in ways beyond just the activists and politicians involved. They represent desperate efforts to wring the planet of its remaining fossil fuels, which have until recently been cost prohibitive due to their inaccessibility. Fracking, which is short for hydraulic fracturing, is a process that requires mass amounts of water and chemicals to tap into natural gas reserves. Methane, a far more potent greenhouse gas, is usually released as a byproduct, effectively counterbalancing any benefits of switching from coal. In turn, the tar sands industry uses enormous amounts of fracked gas and water to extract the oil from its reserves, which are second only in size to Saudi Arabia. Given that every barrel of tar sands oil emits three times the amount of greenhouse gases as conventional oil, it’s no wonder NASA scientist James Hansen has warned that further development would be “game over” for the climate. Furthermore, the tar sands and fracking processes are known to contaminate water, poison the air, and, in general, diminish the quality of life. For many, these environmental health factors are the most pressing. Craig Sauter–a resident of Dimock, Pensylvania, which has been called natural gas drilling’s ground zero–spoke of his troubles getting Cabot Oil & Gas, the company that drilled on his land, to pay for poisoning his well water with methane, arsenic, barium, and uranium. The Pennsylvania Department of Environmental Protection (DEP) has also refused to help despite Sauter’s exhaustive efforts to engage them. The state capitol police are now threatening to arrest him if he calls the DEP one more time. Upon hearing this, the crowd chanted, “We will call for you.” Plans are also in the works to for a protest in Dimock at the end of the month, when Cabot takes away the drinking water tank they provided Sauter, before shirking any responsibility. Another stirring account was rendered by Stephen Cleghorn–an organic farmer from Pennsylvania’s Jefferson County, whose land was leased for natural gas extraction without his knowing. He offered a heartfelt, if not wrenching, story of testifying before an impotent Department of Energy subcommittee on natural gas, while his wife was dying of cancer. 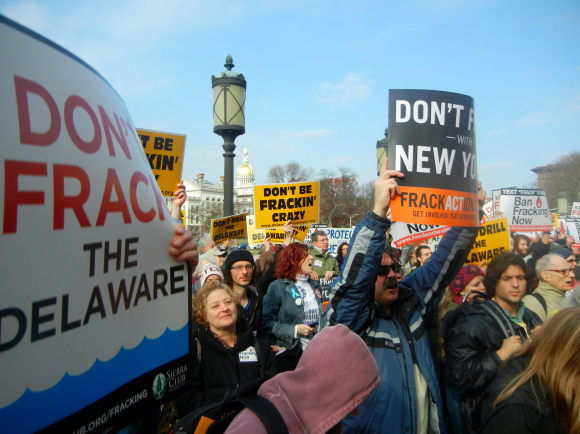 Immediately following these testimonials, the crowd marched to the New Jersey State Legislature, demanding they “ban fracking now.” Of course, New Jersey’s legislature was the first of any state in the country to ban fracking. It passed overwhelming, but Governor Christie vetoed it, proposing a one-year moratorium instead. Nevertheless, activists seem hopeful that the legislature might overturn Christie’s ruling. And why not? They’re starting to get the kind of momentum leaders were hoping for years ago. In his address, Oscar-nominated director Josh Fox, whose 2010 documentary Gasland made fracking a national issue, reminded the crowd of one such leader, the recently imprisoned Tim DeChristopher. In keeping with the mood, however, Fox made sure to follow up this feel-good sentiment with a hard-hitting call to action, saying, “When it comes time to blockade the well-sites, we’ll blockade the well-sites.” And before the day was over, the crowd retreated to a nearby Quaker meeting house, where nonviolent direct action trainings began–assuring that this movement, if the time has come to call it that, is not about to let any amount of success go to its head.